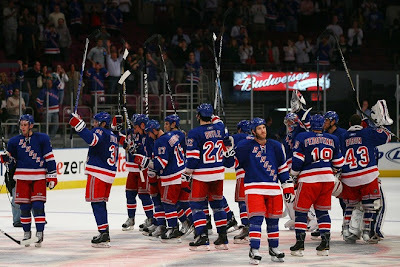 Aside from the sloppy and uncoordinated play during last night's first pre-season game at MSG, the half-rookie/half-veteran Rangers scored a win against the almost-fully-loaded NJ Devils of Newark in overtime, NYR 4, NJ Devils 3 OT. Nothing feels better than the hockey season opening and a handful of rookies taking it to Fatty Brodeur. Marty Biron was in goal for the Blueshirts, and later replaced by Chad Johnson. Both Dan Girardi, and especially, Marc Staal did their best impressions of the Tin Man -- as you could see the rust falling off them. Ryan McDonagh has arrived as promised, delivering a solid, conservative performance that will certainly make the Rangers-Brass think about not using another defender's $6.5 million toward the cap this coming season. Who could that be? Everything else about the game felt pedestrian and 'as-would-be-expected' for a pre-season opener. The game could have gone either way -- but some of these highlights made it worth showing up. Unrelated to last night's game, I am reminded that New York Rangers fans are the best in the world --- when we are playing our hardest, we know it. That's why we show up. To support and criticize the team we love. But we also know that pre-season games are an extension of camp, where coaches introduce new players and the wins/losses are secondary in the big picture. We are a civilized bunch. On the other hand, across the land of Canada -- freak-like Toronto Maple Leaf fans and even scary-French-Canadien Hab-fans treat their hockey a little differently, holding their beloved teams to the highest degree even during these pre-season games. See here for the Leafs. See here for the Habs. Although any clinical pyschologist might consider this fan reaction of 'having to win' a form of addiction (or maybe alcoholism? ), you should probably take the casual advice of Damien Cox of The Star and Carey Price and......CHILL (THE F*CK) OUT! So, see you at The Rock on Saturday night as we face Farty Brodeur a second time this week. 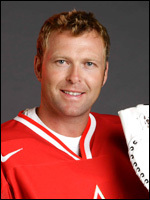 If you happen to pass a large carcass of rotting meat in the Prudential Center prior to the game, just let it be as Marty will later engulf his prize; if any of you are new to the NJ Devils, it is widely known that goaltender Marty Brodeur eats large amounts of meat when he loses. It's a fact. ;) Some teams throw octopus on the ice, some throw Grade B loin scraps. That's Marty for ya. It's great to be back in Ranger Land, folks and we look forward to your commentary and continued readership. One thing I can always count on is a good Maaaaahhhh-tttttty Brodeur dig. Missed you Dark. Time to talk hockey. I thought Mcdonaugh looked like he was meant to be there and I think he will make the cut. Dale Weise and Michael Sauer were also impressive as was Brian Boyle...agree? Agreed. Both Weise and Sauer worked hard, but I don't think they'll make the cut. That might have been Boyle's best performance we've seen (which I failed to mention in the post). Thanks for pointing that out, Leatherneck!